In reality, true hip-hop fell off the radar screen right around the turn of the millennium. Just as mainstream music began to absorb hip-hop, a splinter faction broke off and began to innovate in a new direction. These neo-oldskoolers found refuge in a new kind of record label: Definitive Jux. All indie hip-hop, all the time, and with a producer that really understood the culture and the music. So while the radio was obsessed with "ridin' dirty" and Lil John, indie (or underground) hip-hop thrived in live venues, and later proliferated over the internet. In fact, I would say that it found it's true home on streaming radio stations like smoothbeats.com. So, while I have no idea what the wiggas next door are listening to, I am still a hip-hop head. 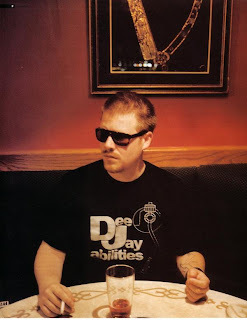 And thus, I listen to almost every Def Jux artist, especially to their resident producer, El P.
"The son of jazz pianist Harry Keys (born Harry Meline), El-P (born Jaime Meline) became involved with the hip hop culture of New York City at an early age. After being expelled from several schools for problems with authority, Meline decided to whole-heartedly pursue a career in music. At his 18th birthday party, he met Mr. Len, whom he had hired as a DJ for the night. The two quickly became friends and formed Company Flow in 1992. They released their first vinyl single, "Juvenile Technique", in 1993. Bigg Jus later complemented the group and in 1996 the trioEP, Funcrusher. Subject to a major label bidding war after the success of the EP, Company Flow waited until they could get a contract on their own terms. They eventually signed to Rawkus Records, and released their debut full-length album, Funcrusher Plus (1997), which is now widely recognized as one of the most ground-breaking and influential alternative hip hop albums of all time." What makes El P an innovator? It's the beats AND the lyrics, baby. His tracks are utterly absorbing in their originality, although he's not ashamed to sample when he needs to. And his lyrics reflect the soul of a true poet. No sh*t. Here are his lyrics from TOJ (Time Out of Joint). Any guy who has loved and lost.......and matured, will understand this. As will the woman. And I'll be god damned if you can’t see that yourself"